Note well the two photographs: on August 23, 1939 Soviets sign the secret non-aggression treaty with Nazi Germany. The treaty paved the way for the September 1,1939 military operations against Poland and, among other things, divided Baltic territories into Nazi and Soviet "spheres of influence." The two partners found it convenient to pay each other off in gold when dividing a certain Lithuanian territory. The supreme surprise came in 1945: the Soviets, who helped to start the war, were among the victors. The facts about the 1939 Nazi-Soviet Pact are heavily censored behind the Iron Curtain today. However, in 1979 the Lithuanian underground publication "Alma Mater" gave the subject matter a thorough, documented treatment. Drawing the analogy between 1939 and the three infamous partitions of the Lithuanian-Polish Commonwealth in the 18th century, the article was titled "The Fourth Partition." His Excellency the President of the United States of America Washington, D.C.
• Recent changes in Soviet criminal law have further restricted the rights of Soviet citizens, increased penalties for offences, and tightened state controls, "The Observer" reports. Moscow's effort to isolate its citizenry from foreign contacts also was evident in the June 1981 Law on the Status of Foreigners in the U.S.S.R., which included a section on the expulsion or criminal prosecution of foreigners found guilty of transgressing "...rules of the socialist community [or] the traditions and customs of the Soviet people or of endangering state security." Now, the U.S.S.R. has laws aimed against both foreigners and Soviet citizens who engage in unofficial contacts. Other changes in the criminal code have simplified the legal procedure for sentencing labor camp inmates to an additional term of imprisonment before completion of their original sentences and have subjected members of the Soviet Armed Forces to harsher punishment for infractions of military discipline. The Department of State publication, "Country Reports On Human Rights Practices for 1984" (February 1985) provides information on the subject topic in Lithuania as well as other countries. It is a report prepared for congressional committees. The January 1985 edition of the "Communications of the ACM" published a special report on computer professionals whose scientific freedom and human rights have been violated in 1984. According to the report, there are 195 known computer professionals in this category. 134 of them live in the Soviet Union. The report does not feature anyone with obvious Lithuanian names. However, one resident is listed in Vilnius, Lithuania and four individuals come from Riga, Latvia. "Communications" is published by the Association for Computing Machinery, a premier society of the computing community. The report was prepared by the ACM Committee on Scientific Freedom and Human Rights (CSFHR). Interestingly, the CSFHR has established a program in which ACM chapters "adopt" individual scientists and correspond with them. Such correspondence should touch on the personal and scientific and not discuss political matters. These letters greatly improve the morale of the recipients and are one of the few ways they can keep current with computer science and technology. Articles in the American press on the Baltic States are sufficiently rare that when one does appear it deserves close scrutiny and, if well written, may be cause for mild celebration by friends and interested observers of the Baltic States. Manuela Hoelterhoff's „Baltic Memories," published in The Wall Street Journal (December 19, 1984), is one of the very best op-ed pieces on a Baltic theme to find its way into a major American newspaper in quite a while. The author, who is the arts editor of the Journal, shares her experiences of a recent visit to her mother's native Latvia. With profound sadness, Hoelterhoff relates what she and her mother witnessed on their trip: the Russification, Sovietization and militarization of Latvia, and its material and spiritual impoverishment. The author contrasts this portrait of contemporary Latvia to the vitality, sophistication and beauty of pre-Soviet Latvia, reminders of which she finds in the architecture of Riga, a faded photograph of her grandmother's house and her family's collective memory. Through her eyes the reader sees signs of the slow but seemingly inexorable eradication of Latvia's national culture. Hoelterhoff's strength lies in recounting the tragedy of Latvia with heartfelt sympathy but without self-pity, and in recalling Latvia's past with nostalgia unencumbered by cloying sentimentality; this, combined with her considerable writing talents, make her argument of Latvia's slow death all the more powerful. Reading and rereading her article, I found myself — a Lithuanian who has long identified with my fellow "Baits — saddened by Hoelterhoff's reluctant resignation to the erosion of Latvia's national identity. I wondered if other Latvians felt as she did. Judging from letters to the editor (The Wall Street Journal, January 9, 1985), many Latvians in the diaspora apparently agree with her grim assessment. Six of seven letters responding to Hoelterhoff's article were written by persons of Latvian descent. All of them declared their enthusiastic approval of her piece. The correspondents expressed the hope that Latvia's decline would be reversed — one calling it "an almost unbearable longing" — but none voiced any optimism that it actually would come to pass. Lithuania and Estonia share Latvia's fate in the sense that for all three the Kremlin's policy of Sovietizing their cultures and militarizing their soil has been successful. Sovietization has altered the development of national culture in each of the Baltic States, but by itself does not appear to pose a mortal threat to the survival of national identity. However, Russification, coupled with Sovietization, constitutes just such a threat. This is where the paths of the Baltic States diverge, with Latvia seemingly headed for national extinction, Lithuania maintaining a tenuous hold on the status quo and Estonia somewhere in between. Hoelterhoff's article made me more appreciative of the fact that while Russification is an as yet ineffective threat to Lithuania that nevertheless must be taken seriously, to Latvia it is a poison that is spreading throughout Latvian society. The statistics bear this out. In 1960 the percentage of ethnic Latvians living in Latvia stood at 61.7 percent. By comparison, the figures for Estonia and Lithuania were 74.1 percent and 79.6 percent, respectively. By 1980 little more than half of Latvia's residents — 53.5 percent — belonged to the indigenous nationality group. The figure for Estonia in that year was also disconcerting — 64.5 percent, or a drop of almost 10 percentage points in two decades. Only Lithuanians held their own, with 80.1 percent of the populace identifying themselves as ethnic Lithuanians. A variety of factors account for Lithuania's more favorable demographic position. They have to do with Latvia and Estonia's more highly developed industrial bases, the protracted partisan war in Lithuania following World War II, nationality politics, the influence of Roman Catholicism on Lithuanian society, etc. Most of these factors no longer work to Lithuania's advantage, however, meaning that Lithuanians too may have to face the long-term prospect of becoming a minority in their own country. In the short run, though, this unwelcome prospect looms large nor for Lithuanians, nor Estonians, but for Latvians. It would be presumptuous to say that the Russification trend in Latvia cannot, or will not, be reversed. But it is fair to ponder how — short of a sudden, miraculous end to the Soviet occupation of Latvia within the next decade — an independent, democratically governed Latvia for and by Latvians can ever be reconstituted. I have no prescriptions for Latvia's resolution of this dilemma, only a deeper sympathy for its plight, thanks to Hoelterhoff. She laments that if only the Soviets allowed Latvia to remain an agrarian republic, it might not be the materially impoverished military outpost of the USSR that it is today. That view seems somewhat irrelevant — since Latvia's paramount problem is Russification — and unrealistic, considering that Latvia's industrialization was well under way before the first Soviet tank crossed the Latvian border. It seems, rather, that we ought to lament the accidents of history, which fate has decreed should weigh so heavily and so unfairly against the Baltic States, especially Latvia. What can be done for Latvia? Those in the West need to appreciate fully the seriousness of Latvia's plight. At a minimum they should be more forthcoming with moral and spiritual support. As for diaspora Estonians and diaspora Lithuanians, it is important that they rally around the banner of Latvia in greater force than they have up to this point. The major battleground in the campaign to Russify the Baltic is Latvia. As goes Latvia, so may go Estonia and Lithuania. Any listing of the many diverse cultural manifestations of the Lithuanian post-World War II community in the U.S. should include the Symposia on Science and Creativity, a series of quadrennial events that began with the first symposium in 1969. These symposia were held in Chicago, — the city with the largest Lithuanian community in the U.S., during the long Thanksgiving weekend so as to permit the programming of three-and-a-half consecutive days packed with lecture sessions. The purpose of these symposia is to demonstrate the cultural vitality of the Lithuanian emigres: to point out that the post-World War II emigrant generation has produced a significant number of eminent professionals, and that the Lithuanian language is a suitable vehicle for expression of complex scientific thoughts. The lecturers invited to the symposia were mostly members of academic institutions, and to a lesser extent — members of the industrial and medical communities. With few exceptions, the lectures were delivered in Lithuanian: the English language was used only by a very few speakers of non-Lithuanian descent whose chosen topics covered some aspect of Lithuanian culture. The majority of lecturers were born in Lithuania but had received their higher education in the U.S. and elsewhere; a smaller percentage was born and educated outside of Lithuania. U.S. citizens predominated among the lecturers; next came Canadian citizens, and only a small percentage were from Australia and Western Europe. Also, nearly every symposium featured 2 or 3 lecturers from Soviet Lithuania. The number of papers presented in these symposia ranged from a low of 62 for the first symposium, to a high of 190 for the most recent. The attendance also increased steadily. During the fourth symposium there were over 2,000 registered attendees. Topical coverage of the symposia encompassed three broad fields: humanities, followed by science, technology and architecture and medicine and odontology. Each of these major fields were divided into a number of sessions. During each session three or four papers were presented. The number of sessions in each field varied depending on the availability of lecturers, but there always existed a certain "core" within each field. Thus the humanities field always included sessions on political science, psychology, literature, law, theology and economics. The science, technology and architecture field featured sessions such as physics, mathematics, chemistry, oceanology, geology, space exploration, computers, civil engineering. To enliven the program, the symposium's executive committee always provided the attendees with additional cultural attractions: exhibitions (paintings, numismatics, philatelies, scientific publications by Lithuanian authors) and a concert or stage play. On the eve of the closing day a formal banquet was held. Also, available to the public on the opening day was that particular symposium's memorial publication which included, among other things, the biographies of all lecturers and the abstracts of the papers they presented. Currently lecturers are being recruited in preparation for the Fifth Symposium which will take place in Chicago during the Thanksgiving weekend of 1985. NEW YORK TIMES BOOK REVIEWER CHARGED WITH "BROAD ETHNIC SLUR"
"I was dismayed to read a broad ethnic slur in Ralph Blumenthal's review of Allan A. Ryan, Jr.'s 'Quiet Neighbors: Prosecuting Nazi War Criminals in America' (Nov. 11). I was even more dismayed to find it in an article related to the Holocaust, which should have sensitized us to the danger of demeaning ethnic generalizations. Mr. Blumenthal wrote: 'While survivors of the Holocaust remained in displaced persons camps, immigration quotas favored many of their persecutors — Baits, Ukrainians, Poles.' Here a number of East European nationalities are identified wholesale as persecutors of the Jews during World War II. Has it not occurred to Mr. Blumenthal, or the editors, that this sort of blanket statement is of the same moral order as other, more notorious, racial and ethnic generalizations?" "The New York Times", Dec. 23, 1984). ". . .We never called the Afghans 'freedom fighters' among ourselves... Although perhaps somewhere deep in the subconscious (I knew)... that they were (fighting) in the name of independence, ... but our own situation at the time prevented us... from admitting this to ourselves. Perhaps now I am completely ready to consider them freedom fighters..."
ISEKIRI, Estonian samizdat periodical, No. 2, 1983. Robertas Grigas attracted world-wide attention when in 1982 he refused to take the Soviet soldier's oath. The young Lithuanian was immediately subjected to extreme persecution, which included a period of "re-education" in a military stockade. The 64th issue of the "Chronicle of the Catholic Church in Lithuania" contains a protest statement, which Grigas addressed to the editors of the daily "The Battle Flag", published by the Central Asian military district. Grigas charges the newspaper with a gross distortion of his views and outright lies. There is a complete text of his statement in the West. The "Freedom House" and its publications, notably "Freedom at Issue", have performed an enormous service for the cause of liberty throughout the world. Their efforts are especially appreciated by individuals and nations which have been forcibly deprived of the precious gift of freedom. As admirers and supporters of the "Freedom House", we must nevertheless point out two important omissions and errors in the annual "Comparative Survey of Freedom 1985", which was published in the January-February, 1985, issue of "Freedom at Issue". In the survey and throughout the entire issue one finds not a single reference to the Baltic States of Lithuania, Latvia and Estonia. The only exception is an item on page 54 of "Freedom Appeals" entitled "Lithuanian Priest Arrested." Yet a reader would search in vain for this Lithuania in "The Map of Freedom" or in the various lists of "Nations". This disappearance of Lithuania, Latvia and Estonia from the family of the nations of the world is obviously due not to any ill will but to a rather elementary linguistic oversight. In preparing the various lists and tables, the editors of "Freedom at Issue" simply used the term "nation" as identical to, or interchangeable with "state" — an inexplicable error for a publication of this caliber. Especially in the Central and Eastern European context, such usage leads to mere confusion. Did the Greek nation "evaporate" after the fall of the Byzantine State in 1453? The Polish State did not exist during the entire 19th century, but the Polish nation remained fervently alive. When the Czech State disappeared in 1938, did the Czech nation cease existing? So today, Lithuanian, Latvian and Estonian nations unmistakably exist, although their statehood has been temporarily suspended by force. The error is compounded by listing the Soviet Union as a "nation" — another thoughtless habit in the U.S. press. By the Soviet's own and by informed Western definition the USSR is a multi-national entity (whether we call it a State or, more accurately, an empire). • Many excerpts in these pages are reprinted from various underground publications originating behind the Iron Curtain. Typically, these publications are produced on a typewriter, using carbon paper. The penalty for using unauthorized electrostatic (xerox) process, to reproduce, let us say, pre-Soviet era books, is seven years in prison. Several years ago the going black market rate for the xeroxed copy of a pre-Soviet history book on Lithuania was about 200 rubles, a monthly wage of a starting professional. "BALTIC FORUM", Volume 1, Number 1, Fall 1984. It is the first issue of a new journal of news and opinions published by MH International Design and Publications AB, Gothenburg-Stockholm, Sweden. Its purpose is to inform the broad reading public of significant events, developments and trends of thought in Estonia, Latvia and Lithuania as well as in the Baltic communities abroad. The articles in the first issue are devoted to the recent history of the Baltic countries. They include a piece by the recent Nobel laureate Czeslaw Milosz, "The Lesson of the Baltics." Write to MH International Design and Publications AB, Box 410, S-40126 Gothenburg, Sweden. "Reports on Communist Activities in Eastern Europe" is published by the Estonian Information Centre, Box 450 30 104 30 Stockholm 45, Sweden. • An intensive two-week seminar on Lithuanian language, history and culture will take place again this year in August at the Loyola of the Lakes campus, near Akron, Ohio. This is a Kent State University-sanctioned academic program, and college credits may be earned upon successful completion of course requirements. The program is sponsored by the Lithuanian Seminars, Inc., 5620 S. Claremont Avenue, Chicago, IL 60636. "Mr. President! We, political prisoners in the Soviet Union, congratulate you with your reelection as President of the United States. We look with hope at your country, which is proceeding on the road of liberty and human rights. We wish you success on this road." The ten "prisoners of conscience" are imprisoned in the Soviet concentration camp ŽCH-385/3-4, Mordovian ASSR. Viktoras Petkus, a Lithuanian "prisoner of conscience", will be nominated for the Nobel Peace Prize. This was announced on January 22,1985, by Congressman Don Ritter, a member of the U.S. Helsinki Commission on Security and Cooperation in Europe. He said the Commission was currently nominating imprisoned or exiled Soviet Helsinki monitors. In addition to Petkus, the nominees are Eduard Arutunyan, Merab Kostava, Yuri Orlov, Mykolą Rudenko and Anatoly Shcharansky. "We feel that these six courageous men," Ritter said, "symbolizing the best aspirations of their countrymen, have earned the special acknowledgement of the Nobel Institute: the 1985 Nobel Peace Prize." Several members of Congress paid similar tributes at a special ceremony marking the anniversary of the proclamation of Ukrainian independence on January 22, 1918. Viktoras Petkus, a member of the Lithuanian Helsinki Group, was sentenced in 1977 to three years in prison, seven in strict regime camps, and five in internal exile. He was sentenced for the expression of his ideas, which were branded as "anti-Soviet agitation." The outcome of Petkus' trial was preordained by the KGB. The Soviet authorities have imposed a news blackout about Petkus since May, 1984. Urgent appeals have been sent from Lithuania to inquire about Petkus' condition. The concentration of nuclear bombs in Lithuania already poses a great danger to all of us: in some parts of the country, radiation has reached very high levels. The city of Šiauliai is notorious for its particularly intense radiation and has a large percentage of abnormal births. ...The occupying power compels our youths to perform their military service in other "republics", where they must act as occupiers. Draftees must serve in the occupation army under difficult conditions. A young soldier is like a prisoner and must perform the most menial tasks. Hard drinking is rampant among the soldiers. Suicides, desertions with weapons, murder of civilians occur frequently. Cars are frequently searched on the roads in an attempt to catch deserters. ...Reports about mysterious murders of Lithuanian soldiers have become more frequent of late. Boris Pugo, a Latvian from Russia (born 1937) was nominated the new party boss. He came to Latvia with his parents in 1949 when large numbers of Russian immigrants were sent to the Baltic States following mass deportation of the native population. Since 1980, Boris Pugo was chief of the State Security Committee (KGB) of the Latvian SSR. He was responsible for the arrests of alleged opponents tof the regime and for the severe punishment of such persons in recent years. Pugo was relieved of this position by a decree of the Supreme Council of the occupied Latvia on June 14, 1984. August Voss, former First Secretary of occupied Latvia's Communist party, has been appointed Chairman of the Council of Nationalities of the USSR. He is a Latvian born in Russia, and was party leader since 1966. His predecessor as Chairman of the Council of Nationalities was likewise a Latvian, Vitalijs Rubenis. The Council of Nationalities is a parallel institution of the Supreme Council and is supposed to be representative of the ethnic composition of the Soviet population. It meets simultaneously with the Supreme Council but has no political function whatsoever. The Soviet Estonian Writers' League, according to data from different sources, has 120 members. Information about the current year indicates that the membership includes twenty Russians or Soviet Estonian writers using the Russian language, as they are referred to. They constitute a separate section but enjoy all advantages and privileges of membership in the Writers' League. "But in addition to these (twenty) we also have a large active group of 30 or 35 young people, prosaists, poets and literary scholars who write in Russian," Rostislav Titov, Chaorman of the Russian section, recently said at a public meeting of the party group of the Soviet Estonian Writers' League. He noted that eleven original Russian-language works were published in 1983 (there were 93 Estonian-language works during the same period). The older Soviet Estonian authors who write in the Russian language and settled in occupied Estonia soon after the war, were mainly former members of the armed forces, such as sailors released from the Baltic Navy, former front-line reporters and other ex-soldiers who hoped for a career as writers under the Soviet occupation regime in Estonia. Very few of them had earlier published prose or poetry in newspapers or periodicals or even a modest book which, however, had not attracted any attention on the literature market of the Soviet Union. The Estonian Soviet writers writing in the Russian language — as they are officially called — contribute to the Russianization of the image of Estonian cultural life. Characters with Estonian names dominate their books, and these are created after the pattern of the "positive hero", which is a strict requirement of Russian literature. These persons, as well as the setting in which they act, lack any Estonian touch, however. As for the quality of the works of those Soviet Estonian authors writing in the Russian language, the department chairman, Rostislav Titov declared at the meeting of the party group of the Writers' League (see above) in June that "the publication of these works is an event in the life of our literature." He had in mind the life of the literature in occupied Estonia, and he said he was happy to note that one can now speak of the third generation of Russian authors in Estonia. 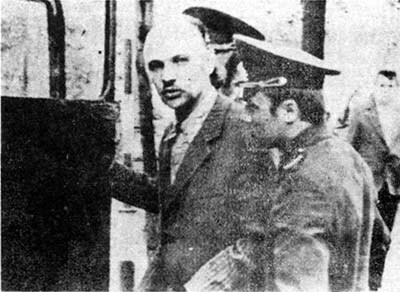 Romas Ragaišis, on trial by Soviet authorities in 1979 for "antisoviet" activities. 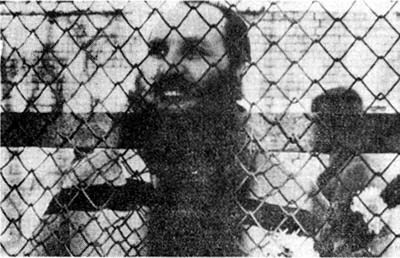 Petras Cidzikas, photographed in 1981 while committed to a psychiatric hospital, where he spent four years. * The author chairs the Executive Committee of the Fifth Lithuanian Symposium of Science and Creativity.